Hello everyone! 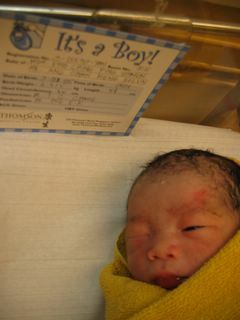 I'm Ashton Ang, born into this world on 3 Jan 05, 8.08am weighing in at 2.915 kg and measuring 48cm. Actually, I'm not suppose to "report for duty" this early, only on the 6 Jan. But, being the cheeky monkey, I danced less in mummy's tummy the last week. 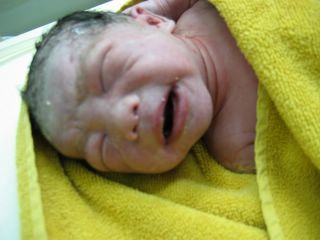 That got mummy, daddy and the the doc worried, and they decided to have me out earlier. So here I am, hello Planet Earth! By the way, mummy and dadday said that I cried really really loud in the delivery room!!! That shows that my lungs are really really strong!!! !